President Trump was serenaded by Philippine President Rodrigo Duterte during his visit in Manila. Winding down his visit to Asia, President Donald Trump repeatedly praised Philippine President Rodrigo Duterte, called him by his first name, shared a joke with him about the media and even complimented Manila's weather. What he did not do Monday was what many of his predecessors made a point of doing while abroad: publicly highlight human rights abuses. Duterte has overseen a bloody drug war that has featured extrajudicial killings. 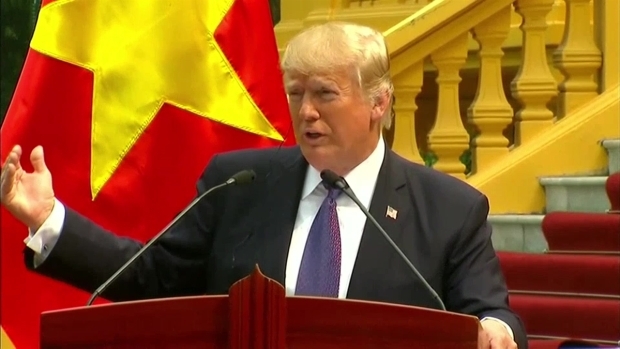 But during brief remarks to reporters, Trump said he and Duterte have "had a great relationship," and he avoided questions about whether he'd raise human rights concerns with the Filipino leader during a private meeting on the sidelines of a summit of Southeast Asian leaders. The White House later said the two leaders discussed the Islamic State group, illegal drugs and trade during the 40-minute meeting. Press Secretary Sarah Huckabee Sanders said human rights came up "briefly" in the context of the Philippines' fight against illegal drugs, but she did not say if Trump was critical of Duterte's program. That appeared to conflict with the Filipino version of the meeting. Harry Roque, a spokesman for Duterte, said: "There was no mention of human rights. There was no mention of extralegal killings. 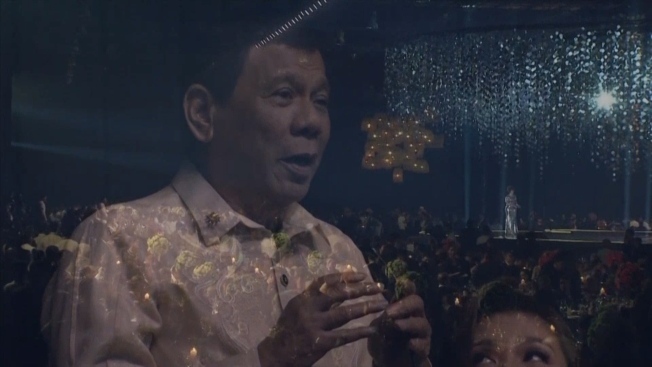 There was only a rather lengthy discussion of the Philippine war on drugs with President Duterte doing most of the explaining." President Donald Trump winds down his first official trip to Asia in the Philippines. After walking back from his comments that he believed Russian President Putin's denials, he heads back to the U.S. and faces a Republican Senate election controversy. Despite all that, they later issued a joint statement saying that "the two sides underscored that human rights and the dignity of human life are essential, and agreed to continue mainstreaming the human rights agenda in their national programs." Duterte's war on drugs has alarmed human rights advocates around the world who say it has allowed police officers and vigilantes to ignore due process and to take justice into their own hands. Government officials estimate that well over 3,000 people, mostly drug users and dealers, have died in the ongoing crackdown. Human rights groups believe the victim total is far higher, perhaps closer to 9,000. In Manila for the Association of Southeast Asian Nations conference, Trump looked to strengthen ties with Pacific Rim allies, aiming to strike one-on-one trade deals rather than multinational trade agreements, and increase pressure on North Korea to abandon its nuclear program. He met with Indian Prime Minister Narendra Modi and highlighted their two nations' "deeper and more comprehensive" ties, looking to strengthen a relationship that is vital to the U.S. vision of an Indo-Pacific region that attempts to de-emphasize China's influence. He jointly met with Australian Prime Minister Malcolm Turnbull, with whom he had a contentious phone call last winter, and Japanese Prime Minister Shinzo Abe, who hosted the president in Tokyo earlier in the trip. Trump raved about his accomplishments on his five-nation journey, particularly on trade and on North Korea, which the White House has suggested may be designated a state sponsor of terror. Trump said he would wait until his return to Washington on Wednesday to elaborate with a "major statement" on those two topics but hinted at progress while in Manila. One year ago Donald Trump was elected President of the United States in what many considered to be an upset victory over Hillary Clinton. Now, one year later, Democrats are celebrating, winning closely watched governor's races in New Jersey and Virginia, and other victories down the ballot. "We've made some very big steps with regard to trade — far bigger than anything you know," Trump told reporters, pointing to business deals forged between U.S. and foreign companies. 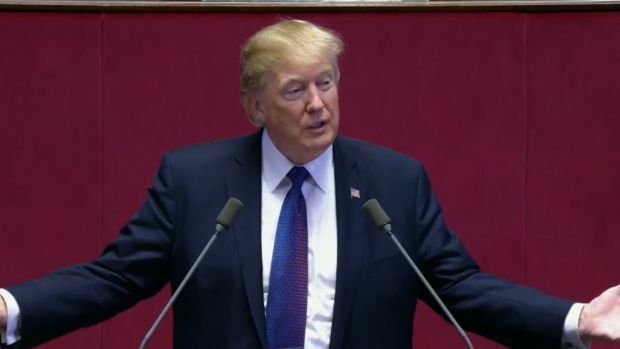 Trump also said the trip had been "very fruitful" for the United States and pointed to the warm welcomes he had received in capitals like Tokyo, Seoul and Beijing. "It was red carpet like nobody, I think, has probably ever received," Trump said. "And that really is a sign of respect, perhaps for me a little, but really for our country. And I'm really proud of that." Associated Press writers Ken Thomas and Laurie Kellman in Washington contributed to this report.